Lots of people may be on vacation right now, but Kickstarter isn’t. The crowdfunding site has some great new Apple-related (s aapl) accessories that could be just what the doctor ordered if you are flush with post-Christmas cash or a guilty indulgence if shopping cleaned you out. The TidyTilt carefully avoids using the actual words “Smart Cover,” which is a smart move given Apple’s propensity to quickly and strongly defend its trademarks. But as a segmented, magnetic cover that also doubles as a stand, it has striking similarities. But the TidyTilt isn’t designed first and foremost as a protective device; it doesn’t cover your screen, after all. Instead, it lives on the back of your iPhone 4 or 4S, thanks to an adhesive magnetic frame, and provides on-the-spot cord and cable management. 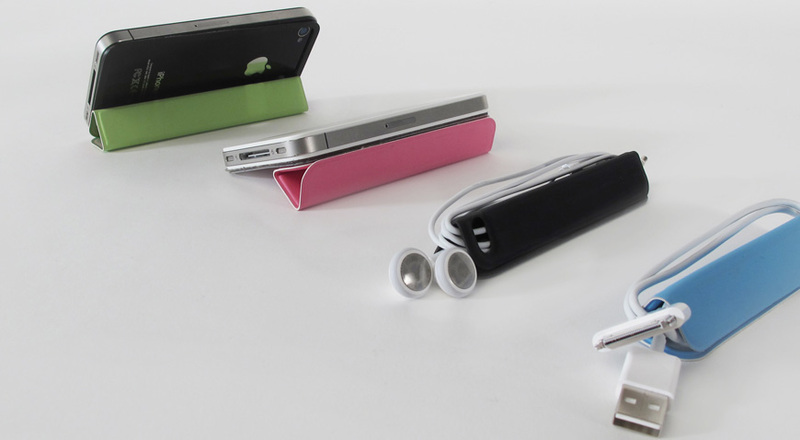 The magnetic strip attaches to your iPhone’s back surface with a removable adhesive, and it can then be used to stick the device to metal surfaces. It also connects with magnets in the TidyTilt itself to keep it in place on the back of your device, adding very little extra depth. The TidyTilt panel can be folded to act as a spool for earphones or a dock charging cable, and it can also be used to prop up your iPhone for viewing or typing. It’s a remarkably versatile but somewhat hard to describe system. Check out the video below to see it in action. Just a $19 pledge nets you a preorder for the TidyTilt, which is pretty cheap for what looks like a completely unique yet highly functional iPhone accessory. The diFeltro Fold enters a crowded market: iPad bags. But this handcrafted beauty, designed in the U.S. and made in Italy using German wool felt and Italian leather, oozes style and practical usability. It should add very little weight to the iPad itself, and it has a magnetic pocket for cables, chargers and accessories and should prove a long-lasting iPad companion. If you want to impress at the board meeting as well as among your friends, the diFeltro fold is an awesome balance between fashion and function. A $150 pledge nets you a preorder, which is sure to be a heavy discount off the retail price for a handcrafted product that uses these kinds of materials. 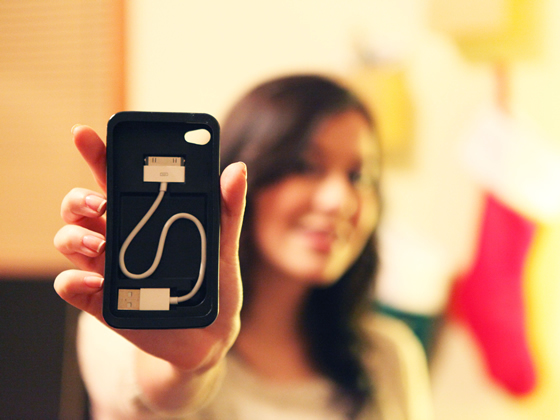 The Cord-On-Board iPhone 4 and 4S case packs a hidden secret: a dock charging cable that is always on hand when you need one. For those who have left the things in hotels across the world, this will definitely come as a welcome innovation. The case comes with a short dock-to-USB cable to use for charging and syncing purposes with your iPhone, which can be stowed out of site within the shell of the case itself. It adds a little bulk to the iPhone but also an ergonomic curve to the iPhone’s back that might actually make it more comfortable to hold. Plus, every case ships with a removable screen protector. Preorders for the Cord-On-Board start at the $25 pledge level. It’s an interesting concept that could definitely strike a chord with travelers, but it still has a lot of funding to gather before it meets its $20,000 goal. Got an exciting Kickstarter project? Send it to us for consideration in our regular roundup of promising accessories.